By Eric Thomas: Klitschko manager Bernd Boente believes the September 10th bout between WBC heavyweight champion Vitali Klitschko (42-2, 39 KO’s) and Poland’s Tomasz Adamek (44-1, 28 KO’s) will be a bigger fight to United States’ audiences than the July 2nd bout between WBA heavyweight champion David Haye (25-1, 23 KO’s), according to fightnews.com. Boente thinks that Adamek is a more recognizable fighter to U.S audiences compared to Haye, because Adamek’s fights have been shown on television in American. None of Haye’s fights have been shown in America. Boente also thinks that because of the large Polish community in the United States, they will help make the Adamek-Klitschko fight more important than the Haye-Wladimir bout. The Vitali-Adamek fight will be taking place at the Stadion Miejski, in Wroclaw, Poland on September 10th, and like the Haye-Wladimir fight, it will be shown on HBO. However, other than the popularity factor of the two different fights, Adamek vs. Klitschko is expected to be badly one-sided because Adamek doesn’t have the size, the chin or the power to really compete with Vitali. Adamek doesn’t think that Vitali is much bigger than him, but he’s wrong. Vitali will be at least four inches taller than 25 to 30 pounds heavier. When you add in Vitali’s longer reach, much better chin and power in both hands, you get a mismatch. Adamek will run around and keep from getting knocked out but he’s expected to fall behind quickly in the fight and lose round after round to the point where he will be desperate late to try and make up for the lost rounds. Its doubtful that Adamek will want to take big risks against Vitali and end up getting knocked out. The Haye vs. Wladimir fight could be a much more competitive fight because Haye is faster than Wladimir and he could end matters with a single punch if he can catch Wladimir cleanly. The fight might not be as popular as Adamek-Vitali, but it’s expected to be much more explosive because both Wladimir and Haye come to fight. This won’t be a case of Vitali having to chase Adamek around the ring all night long while the large polish crowd falls asleep. 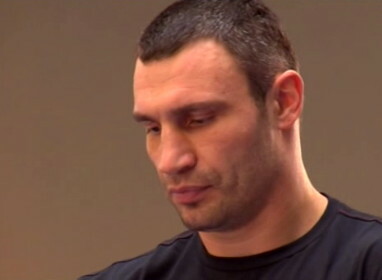 Haye will be looking to take Wladimir’s head off and vice versa.